In every workshop, I complete a number of painting demonstrations, each lasting about an hour and fifteen minutes. Calico Cat, was painted before a live audience. This is an 'oldie but goodie' moved from my original website. It deals with many of the common issues painters confront as they paint. For this watercolor painting, I am working from a photo rather than from my customary ink sketch. The photo is only a starting point, and needs many changes. 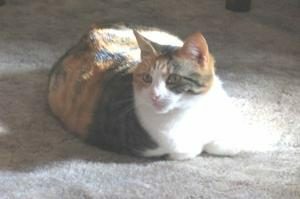 The cat is a circle shape centered in the space—not a good design. 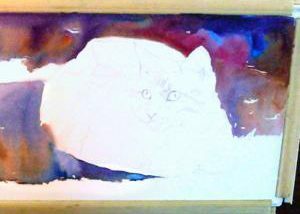 So I plan to merge the cat into the background and create a more interesting white shape. The color in the photo is very ordinary and unexciting. I need to jazz it up! I paint the background first. My value range in the background is dark to middle. My usual method is to plan the value structure ahead. However, I paint intuitively with color, making it up as I go along. 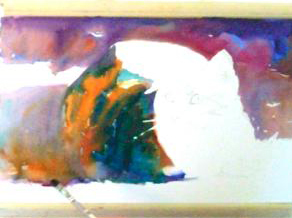 Here I am starting with a limited group of colors: ultramarine blue, quinacridone burnt orange, and quinacridone violet. 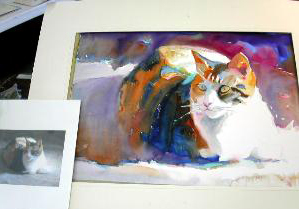 Next, I paint the shadow on the cat, making sure to let it dissolve into the cast shadow. Lost and soft edges create movement when painting animals. We don't want the cat to seem 'frozen', but rather it should feel as if it can move. Also, I attempt to lay the paint in boldly, with a fair amount of water. This creates organic paint textures and energy. If I am excited about my painting and 'energized', this mood is likely to flow into the finished art work. I continue working into the face area of the cat. This is my center of interest, so I want it to have more color, contrast and detail than the rest of the painting. Phthalo green, quinacridone gold and quinacridone rose are added to the previous colors. 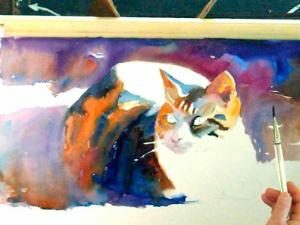 On the light side of the cat, I want to maintain lost edges within the white shape, letting one uninterrupted shape complete the illusion of light on foreground, cat's body and face. As I complete the painting, it is essential to avoid the temptation to rework or fix areas. This can quickly destroy the original paint energy. As a matter of discipline, I tell myself, "If it is already painted, leave it alone and move on." After the painting is finished, if it is still a problem, then I may adjust an area. Often things that are bothersome in the beginning are not even noticeable in the final stages. After I have been away from the painting for several hours, I come back and look at the painting with a 'fresh eye.' At this time I often make small adjustments, such as softening edges or adding additional small bits of color. 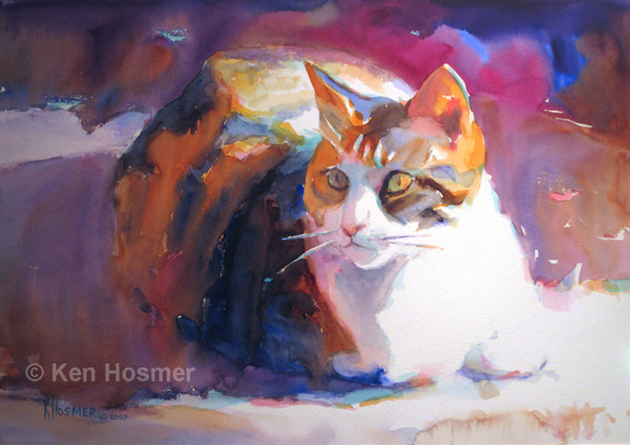 If you enjoyed this painting demonstration, please visit my web site (kenhosmer.com) for a selection of art instruction videos - or join me for a workshop!